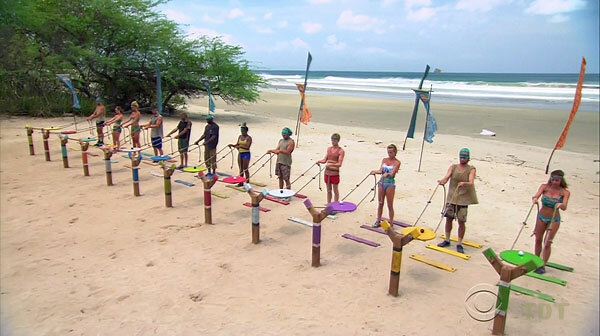 Survivor: San Juan del Sur (2014) - 12th place, 7th out. Quit in Episode 7, "Million Dollar Decision" (Day 18). San Juan del Sur Ep. 1 IC: "Temple of Syrinx" - Retrieves a bag, works the puzzle, and Hunahpu wins. San Juan del Sur Ep. 2 IC: "Sumo at Sea" - Sits out as Hunahpu wins (no win credit for sitting out). San Juan del Sur Ep. 3 IC: "Game of Throw-Ins" - Paired with Missy, loses a point to Wes/Alec, but Hunahpu wins, 3-2. San Juan del Sur Ep. 4 IC: "The Cruel Sea" - Almost throws a ring, but defers to Drew, whose IC-throwing shenanigans cost Hunahpu the win. San Juan del Sur Ep. 5 IC: "Shakedown Street" - Now with New Hunahpu, which wins, easily. San Juan del Sur Ep. 6 IC: "Flips, Flops & Flags" - Sits out, as Hunahpu wins. San Juan del Sur Ep. 7 IC: "Take the Reins" - Third to drop out, at 9-minute mark (10th/12). San Juan del Sur Ep. 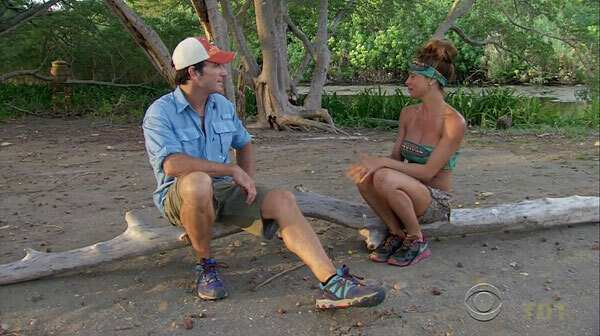 2 RC: "Parallel Universe" - Wins vs. John, but Hunahpu negotiates away her reward (fishing gear) to get a new flint. San Juan del Sur: None. San Juan del Sur, Ep. 4: Drew Christy (voted out, 5-2-1-1). San Juan del Sur, Ep. 4: Two votes, from Reed and Keith. Thanks for volunteering me for this, John! Hey, this place is fun! Yay, they won! Safety! Horrible, horrible safety! ...and done. Quit, Day 18. Dalton Ross at EW.com (8/27/14): "New Survivor casts boasts MLB player John Rocker, Spider-Man actor, and Amazing Race twins"
Gordon Holmes at XfinityTV.com (11/6/14): "Julie - 'I Just Saw Straight Through (Missy)'"
Rob Cesternino at RHAP (11/6/14): "Exit Interview with the Latest Player Eliminated from San Juan del Sur"
Josh Wigler at Parade.com (11/6/14): "Julie McGee On Her Big Survivor (Trail) Mix Up"
Personal Claim to Fame: Creating my company True Glow Spray Tan. Inspiration in Life: My mom is my hero. She is my rock. She is supportive to my dreams and is my guiding light. She is a huge inspiration for me because she has been through so many hardships but remains positive and driven for success. Hobbies: Trips to Vineyards with my closest girlfriends, inventing product ideas, cooking and working out. Pet Peeves: People that take life too serious, road rage, arrogance and super demanding people. 3 Words to Describe You: Loyal, determined and positive. Survivor Contestant You Are Most Like: Colleen Haskell because I think we both are extremely sweet to others around and by this she was able to make allies without being manipulative. Reason for Being on Survivor: The experience and for the possibilities of future Survivor shows. I would love to compete more than once. Why You Think You’ll “Survive” Survivor: I am the most observant person. I’m told by everyone that knows me that I can figure out someone’s state of mind and intentions within minutes. I’ll bring that strong instinct to the game to help my team win. Why You Think You Will Be the Sole Survivor: I am super determined when I put my mind to a task. I am not one to look for help, if I need something, I make it happen. I believe I could be one of the last few on the show. What Does It Mean to You to Play Survivor with Your Loved One? The game will allow us to use the difficult nature of the experience to dig deeper into our relationship. I know it will be challenging both physically and mentally but I’m happy to be sharing this new journey with John."